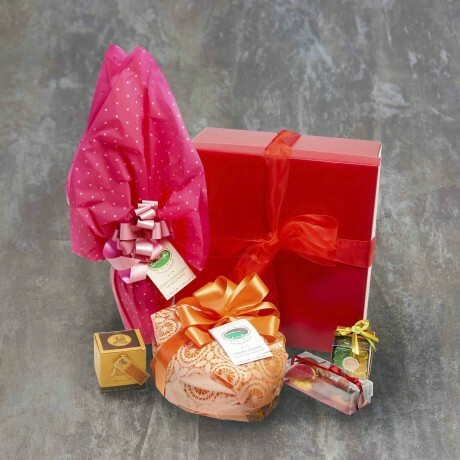 The Happy Easter Gifts Hamper makes a great present for foodie friends and relatives! Hand made milk chocolate Easter egg (250g). Pure milk chocolate eggs contain 33% best quality cocoa and have an intense, not too sweet flavour. Find a surprise inside! Espresso Coffee Chocolates Gift Bag (100g). These exquisite extra dark hand made chocolates are filled with delicious Italian Espresso Coffee cream. Hand made milk chocolate Easter egg (250g). Pure milk chocolate eggs contain 33% best quality cocoa and have an intense, not too sweet flavour. Find a surprise inside!Colomba Easter Cake (900g). This traditional Italian Easter cake is hand made and in the shape of a dove. Similar to a Christmas Panettone, it's soft and moist, with candied orange inside and a crunchy almond topping.Marzipan Fruits (350g). Realistically coloured with natural, vegetable dyes and shaped like fruits and vegetables, these hand-made marzipan sweets taste and look amazing.Limoncello Cream Chocolates Gift Bag (100g). Individually wrapped, luxurious Grand Cru dark chocolate (min 75% cocoa) from the Dominican Republic filled with a burst of Mediterranean flavour! Espresso Coffee Chocolates Gift Bag (100g). These exquisite extra dark hand made chocolates are filled with delicious Italian Espresso Coffee cream. Wheat, butter, almonds, eggs, hazelnuts, milk, soybeans, gluten.